Interview: Chrystia Freeland, Author Of 'Plutocrats' Reuters editor Chrystia Freeland traveled the world, interviewing multimillionaires and billionaires for her new book, Plutocrats. She says there's a startling disconnect between those at the very top and the rest of us — one that has the power to transform society in unfortunate ways. Journalist Chrystia Freeland has spent years reporting on the people who've reached the pinnacle of the business world. For her new book, Plutocrats: The Rise of the New Global Super-Rich and the Fall of Everyone Else, she traveled the world, interviewing the multimillionaires — and billionaires — who make up the world's elite super-rich. Freeland says that many of today's richest individuals gained their fortunes not from inheritance, but from actual work. "These super-rich are people who, as they like to say, 'did it themselves,' " Freeland tells NPR's Steve Inskeep. "And what's interesting for me, and actually I didn't expect it, I think it's a paradox of this sort of working super-rich, which is that you would think ... that having done it yourself, you might have more sympathy, be closer to the 99 percent." But, she says, that's often not the case. "In many ways, that personal history of really feeling like, 'I did this! By myself!' actually creates more of a chasm between them and the rest of us, and, I would say, a certain degree of disdain." Those at the very top, Freeland says, have told her that American workers are the most overpaid in the world, and that they need to be more productive if they want to have better lives. "It is a sense of, you know, 'I deserve this,' " she says. "I do think that there is both a very powerful sense of entitlement and a kind of bubble of wealth which makes it hard for the people at the very top to understand the travails of the middle class." One standout moment Freeland recalls is a conversation with a billionaire who spoke with great sympathy about some friends who'd come to him for investment advice. "And he said to me, 'You know what? They only had $10 million saved. How are they going to live on that?' I kid you not, he was really worried about them." Today's plutocrats come down across the political spectrum, Freeland says; there are definitely liberal billionaires. "It is, however, also the case that in the United States there has been a real shift away from Barack Obama, and a lot of these guys loved him in 2008 ... They feel really angry at Obama, and it's not just the question of taxes." Freeland calls it "a profound emotional thing." "In America," she says, "we have equated personal business success with public virtue. And to a certain extent, your moral and civic virtue could be measured by the size of your bank account." But the president, Freeland adds, has been moving away from that equation, stating publicly that what's good for the people at the top may not be good for those in the middle. And that feels threatening to the 1 percent, she says. "People don't just want to be rich and successful, they want to be good. And I think it's really threatening to feel like, 'Wow, you mean I'm not as full of virtue and goodness as I thought I was?' "
Chrystia Freeland is an editor at Reuters. Her previous book was Sale of a Century: The Inside Story of the Second Russian Revolution. So how are the super-rich that Freeland interviewed different from the super-rich of the past — say, 1955? Well, there are many more of them, and they're a lot richer than they used to be. "One of the things which is really astonishing is how much bigger the gap is than it was before," she says. "In the 1950s, America was relatively egalitarian, much more so than compared to now." CEOs earn exponentially more now, compared with their workers, than they did 60 years ago. "The other difference is that now the super-rich are global. And that's not sort of a cultural choice of theirs, that is something which is imposed on them by the nature of the world economy," says Freeland. "Increasingly, I think you are actually seeing what, ironically, was the dream of Marxists, right? You are seeing the emergence of an international class." While Marx almost certainly wasn't dreaming of global billionaires, Freeland says he might have recognized what's going on right now. "This notion that borders wouldn't matter, that we would have commonality of interests around the world. Well, guess who got there first? 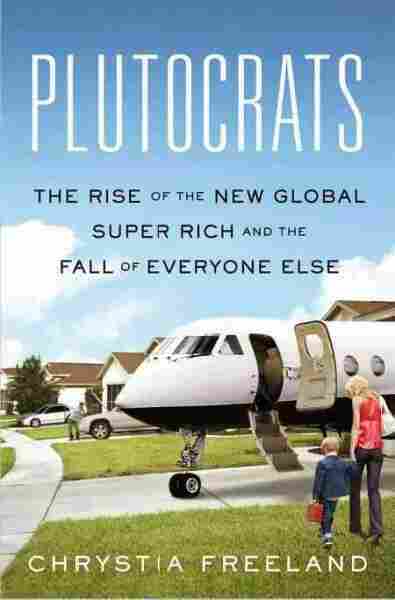 The plutocrats." Freeland says she's worried about what she calls an inevitable human temptation — that people who've benefited from a mobile society, like America, will get to the top and then rig the rules to benefit themselves. "You don't do this in a kind of chortling, smoking your cigar, conspiratorial thinking way," she says. "You do it by persuading yourself that what is in your own personal self-interest is in the interests of everybody else. So you persuade yourself that, actually, government services, things like spending on education, which is what created that social mobility in the first place, need to be cut so that the deficit will shrink, so that your tax bill doesn't go up. "And what I really worry about is, there is so much money and so much power at the very top, and the gap between those people at the very top and everybody else is so great, that we are going to see social mobility choked off and society transformed."